He owns just about every major NHL goaltending record, he’s a three-time Stanley Cup Champion and this past June he was on hand at the end of the NHL Draft at the Prudential Center to make the announcement that the New Jersey Devils were drafting his son Anthony Brodeur (also a goalie). 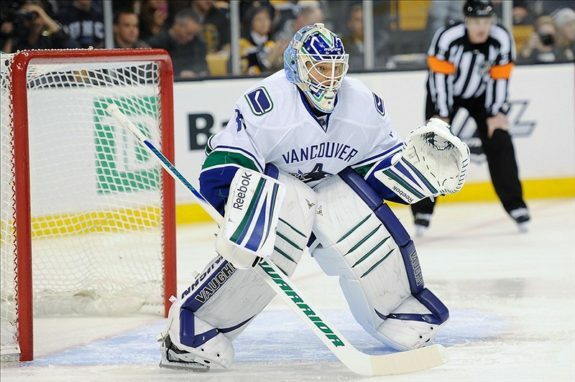 So at age 41, what is really left for Martin Brodeur to play for, other than his love of the game? He was once an ironman in the league, regularly playing in an average of 70 games (during an 82-game season), but the past few seasons his body has started to break down. Here is a list of all of Martin Brodeur’s awards. The other big announcement at the NHL Draft that came in the opening hour was that the Devils had acquired another goalie, 27-year-old Cory Schneider; a likely heir-apparent to his throne in New Jersey’s crease. Now Brodeur is looking at the prospect of playing in only 40-50 games and one of the game’s ultimate competitors seems at peace with it. 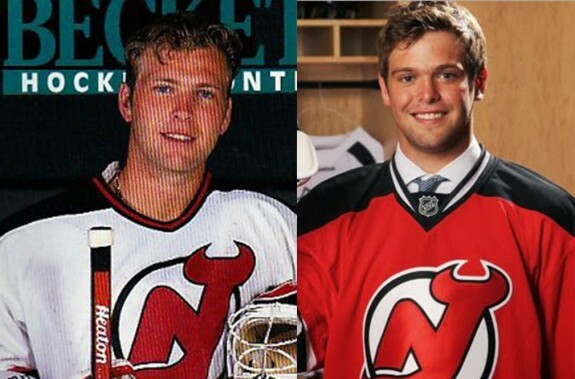 A younger Brodeur may have been insulted by the team bringing in another top-tier netminder, but that’s not the way he is feeling now; now he is offering to help his partner out however he can as he begins a season in search of his fourth championship. The Devils are about to kick off a trip through Schneider’s old stomping grounds — Western Canada — and when Brodeur spoke about it after New Jersey’s home opener, he kind of sounded excited about it. If one were to read into his comments, one might think the legendary goalie may be thinking it could be his last trip out there as a player. In all there are six new players that made the team out of training camp and Brodeur know there will be struggles as everyone adjusts to each other and gets used to each other’s tendencies. “It’s a slow process; I think everyone wants it to be a quick process, but there are a lot of new players learning a lot of different things about our system and gelling as lines & teammates. Sometimes it takes a little time.” He paused and looked around the locker room as a few of the new faces walked by. “Today was not a bad game whatsoever; I thought we accomplished a lot as a team and it would have been a lot more fun to get two points, but it didn’t happen and we have to move on to the road now and get some points over there. As he also mentioned the upcoming road trip could be just what the team needed to come together and quickly learn about each other a little more. Rather than going home to their families after games, they will be staying in hotels and going out to eat with each other among other things as they venture away from New Jersey for five games in five cities over 11 days. If it does end up being his final season, you can bet he will have as much fun as he has ever had playing the game he loves so much, and if you look close enough you will probably see him smiling under his mask.